"I see a bit dimly. I had good vision before. 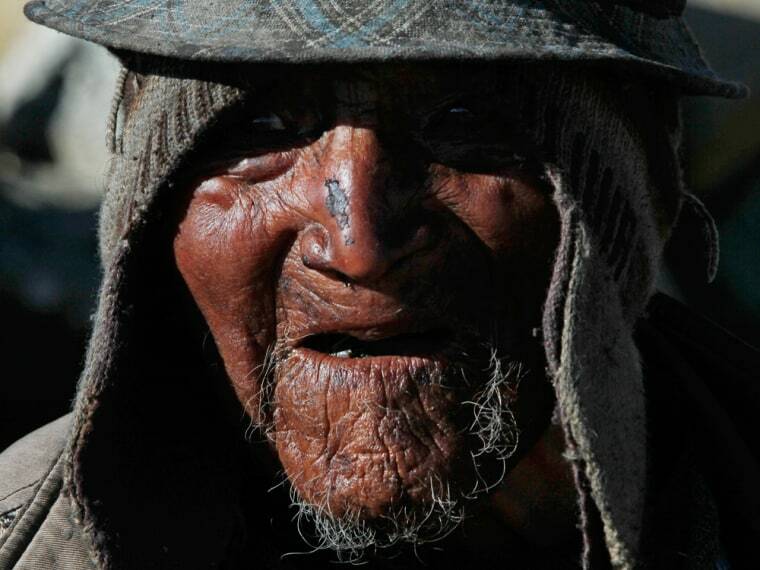 But I saw you coming," he tells Associated Press journalists who visit after a local TV report touts him as the world's oldest person. Guinness spokeswoman Jamie Panas said it wasn't aware of a claim being filed for the Bolivian. "I should be about 100 years old or more," Flores says. But his memory is dim. Flores' 27-year-old grandson Edwin says Flores fought in the 1933 Chaco war with Paraguay but he only faintly remembers. The director of Bolivia's civil registrar, Eugenio Condori, showed The Associated Press the registry that lists Flores' birthdate as July 16, 1890. "For the state, the baptism certificate is valid," Condori said. He said he couldn't show Flores' baptism certificate to the AP because it is a private document. "I walk a lot, that's all. I go out with the animals," says Flores, who long herded cattle and sheep. "I don't eat noodles or rice, only barley. I used to grow potatoes, beans, oca [an Andean tuber]." Flores says he has never been farther afield than La Paz, 80 kilometers [50 miles] away, and has never been seriously ill. He sorely misses his wife, who died more than a decade ago. Of their three children only one is still alive: Cecilio, age 67. There are 40 grandchildren and 19 great-grandchildren but most have left Frasquia, a dozen homes a two-hour walk from the nearest road. Edwin Flores, who lives next door with his wife and their two children, says his grandfather worked for the rancher who owned Frasquia until 1952, when the state seized major holdings in an agrarian reform and parceled them out to peasants. Although electrical power arrived three years ago, time seems to have stood still in Frasquia. Peasants still prepare chuno, or dehydrated and chilled potatoes, and till the soil with ox-driven plows. Donkeys bray and sheep and cattle graze. Most everyone is elderly or middle-aged. The young people are mostly gone.